Rob Macmillian explains how a multimedia approach is helping to track the impact of Big Local, and the benefits and challenges of this unique research method. 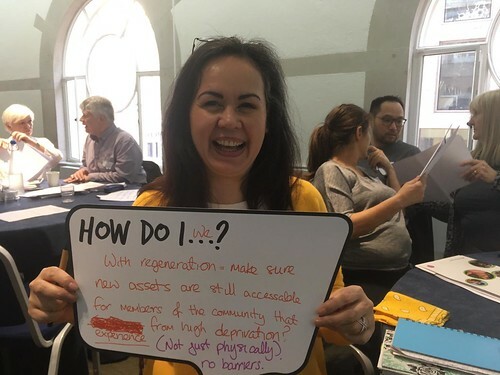 How do we really know what it's really like to be involved in or affected by a community-based programme like Big Local? Or what it means for people? Or whether and how it actually works on the ground in practice? To answer these questions researchers and evaluators will usually try to find people willing to share their views, and ask them to fill in a questionnaire, or to answer a series of questions in an individual interview. They might try to get people together in a focus group, or some kind of roundtable or workshop. In 'Our Bigger Story' we're trying something different - a long term multimedia evaluation of Big Local. Alongside traditional face to face interviews and workshop discussions, we're experimenting with films, podcasts, photographs and diaries which can document the Big Local process over time, from the bottom up. In doing so we're also tapping in to the vast creative effort of Big Local areas up and down the country - with people engaging professional film-makers or making their own short films, posting photos on the web and actively using social media. Multimedia sources can be used in two ways in the evaluation: either as research 'data' in itself, which can be analysed to help make sense of how the programme is working, or as a prompt with residents and others to generate further discussion about the issues at stake in the area. In terms of long term community-based evaluation or research we don't really know of anything like it, so we're reflecting on what we're learning as we go along. What are the benefits of this approach? We think it offers new ways for a wider range of people - beyond 'the usual suspects' - to tell their stories, and, in time, new ways to understand and appreciate change in their communities. Seeing and hearing these accounts through film and photography in some ways helps open up evaluation, and can arguably create a more powerful, vivid and believable sense of real life than simply words on a page. A short film or set of photographs can provide an authentic sense of experience; it can encapsulate so much about the atmosphere of an area or the feelings and expressions of individuals or groups of people. It can also help us see and remember things about our neighbourhoods, positive and negative, that we would otherwise overlook because they are so familiar and every-day. But there are some interesting challenges as well in carrying out a multimedia evaluation. Leaving aside the practical task of storing and making sense of lots of films, photographs, podcasts and the like, we are forced to think about whether people will tend to see them as promotional tools for their areas, and therefore may accentuate only the positive. It is harder for people to retain their anonymity on film or when photographed, and as a result they may choose not to 'speak out of turn'. Or they may agree to take part in the research, but say things on film that they come to regret later on. How, then, might multimedia methods provide some protection for participants, but also have sight of the difficult issues and challenges facing Big Local areas, and their efforts to work through them? Finally we must not assume that a film necessarily gets closer to 'the truth' about an area or issue than traditional approaches to evaluation. All research methods involve multiple decisions about what to focus on, what questions to ask, what things are brought into view, and what things are left out. This is no less true of a multimedia evaluation.